With the onset of internet telephony, most phone companies these days offer unlimited minutes, and even domestic call rates are down to their lowest levels in a long time. But it’s an entirely different story when it comes to making international calls – which still tend to cost a bomb. But it doesn’t have to be so. Thanks to the wonders of technology, there are now many ways to make FREE international calls to most countries on the planet thus eventually helps to save money. Free international calls are now possible because of Voice-Over-Internet-Protocol (VOIP) technology. It’s an affordable and reliable way to stay connected with your friends, family and business circle regardless of where they may be located. 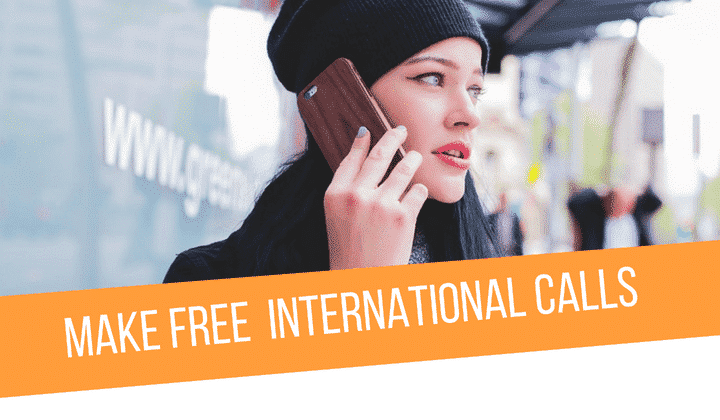 Read on to find out how you can make FREE international calls using Apps (which can be used to make free calls), websites (that provide a free call facility) and how you can make FREE calls without using the internet to stay in constant touch with people abroad. First I will show you 5 apps to make free international calls and then websites and finally ways to make free calls without using internet. This Facebook-owned free calling App is among the most popular choices when it comes to making free international voice/video calls or sending a free message to anyone across the globe. It also has a feature that allows you to send documents (up to 100MB) and a platform to connect business owners which makes it a great tool to conduct business as well. Like WhatsApp, Viber too is also a trendy choice to make international calls for free. It boasts of over on bn users globally, offering them a free and secure connection with free, high-quality audio and video calls, 1-on-1 and group messaging, and many more features. All you need to do is select the name of the person you wish to speak to from your contact list and click on – Free Call. Alternately you can also opt to open the Viber App to choose and connect with the person you want to speak to or chat for free. A telecommunications software product that’s been around since 2003. Skype is known to be the best free international calling app which specialises in providing video chat and voice calls between computers, tablets, mobile devices. It works on all Android, Apple, and Windows devices. However, the FREE calls made on Skype come with conditions attached. While international calls made from Skype to Skype are free, text messages or calls made to traditional phones (cell phones & landlines) are chargeable. A proprietary telephony product developed by Apple Inc., FaceTime only works on Apple mobile devices and Mac computers (that run Mac OS X 10.6.6 & later versions) and is not supported on any other non-iOS device. While the audio and video calls made on the App are completely FREE, you will still need a Wi-Fi connection to connect the call. It is one of the best apps to save money on international roaming charges. Founded by a tech company with Swedish roots 2006, Rebtel is one of the trending apps to make free international calls among migrants and frequent travellers. With Rebtel, callers can connect with anyone they want in over 53 countries, sans a data or even a Wi-Fi connection. What it does is it uses local numbers to connect the call to other Rebtel users. However, users from countries not on the list of 53 countries will need a stable Wi-Fi connection or a 3G data card to use this service. By downloading this application on your PC, you can make FREE calls to 50+ destinations across the globe. The catch here is there is an upper limit (of 300 minutes) for free calls made every week, and they can only be made to pre-selected destinations. So if you happen to call a destination which is not on the list for that week – you will be charged. However, on the plus side, you can carry forward your unused minutes for that week to the next. It enables you to make FREE VOIP calls from your PC, smartphone or Mac to anyone in the world, using just a web browser or their free calling App. No registration, trials, additional plug-ins or credit card needed. The only downside is that the duration of every free phone calls made tends to vary, depending on the country being called and the line provider brings used. This free App can be downloaded from the App Store or Google Play. It’s a free program that allows you to make free, high-quality voice calls to regular phones across a slew of popular destinations worldwide; thus helps to make a call at incredibly low rates to any other phone on the planet. You can also connect with your online friends (pc-to-pc calls) as long as you like, for free. The catch here is that you can only make 3 calls per day (as per their terms) and you have to download their free software onto your PC. PopTox allows users to make free international calls online via their web browser, without having to download any plug-in or application. It can connect your call to more than 1000 carriers globally straight from a web browser. It works just as well on a PC, Mac or a smartphone. All that you need to do is open your browser, type in the number you wish to call and talk for FREE to your friends and family around the world. With WebCallDirect, you can stay in constant touch with your family and friends – via your mobile, laptop, PC and Tablet- without having to worry about high phone bills. The service also offers trial users a limited number of free calls (to prevent misuses) to any regular landline across various popular global destinations. One of the best app to make free calls without internet is Libon. An App-based service which can be downloaded for free from both the Google Play Store and IoS. It enables users to make free international calls on both mobiles and landlines at rock-bottom rates to about 150 destinations around the world. Users also get to make 30 off-net, free national and international calls every month and can earn a max of 60 minutes (per month) by referring friends. You can also make unlimited, free Libon-to-Libon calls via the internet. A no Wi-Fi calling app (available on both IoS & Google Play Store) which allows users to make FREE local & long distance calls from their smartphones and the Web at excellent rates. Those who don’t have the App can also make free phone calls over the internet. Users also have the option of enabling about 90 minutes of off-net calls of which approx.10 minutes can be used daily for making free calls – without using the internet. Based on a cloud-calling concept, this App allows users to enjoy 5 minutes (per week) of call time for making off-net calls and staying in touch with their loved ones. However, these calls have to be routed through their customer service. App users also get to enjoy video sharing of superior quality. Make FREE international calls and enjoy unlimited app-to-app calling and messaging using this App. Primo also allows users to make voice calls (sans the internet) to over 60 countries using their Primo Voice network. You get to make calls (No wifi free calling) using only your cellular minutes and make unlimited voice calls to anyone (on Primo) free-of-cost. You also get to earn minutes by inviting your friends to use the Primo network. This free Android App (available on Google Play) doesn’t require an internet data connection and can be used to make free international calls anytime, anywhere using your Android device. To enable you to enjoy the luxury of making FREE calls, many apps need to show in-call advertisements and rely on the loyalty of premium callers. However, there are rare exceptions to this rule like WhatsApp for example – which is owned by a large & successful company (Facebook) and hence can afford to skip this need. Until a few years ago, making an international call was an extremely rare and expensive luxury afforded by few while the concept of free calls was unheard of. But thanks to the rapid advancements in technology and the onset of VOIP, it is now possible to call people in a distant land without having to pay for it, using a variety of means at our disposal. A clear reflection of how our world is getting smaller and smaller with each passing day…!